Whether you just got started with your first shopping campaign this past week or you’ve been dominating the top of the SERP since the heydey of Death Cab for Cutie, all ecommerce advertisers are familiar with the same unsettling feeling – the sense that you have no idea how you stack up against your industry competitors. That’s why we dug into our customer data to find out how ecommerce advertisers are performing with their Google Shopping and Bing Shopping campaigns. Advertisers in the automotive supplies industry enjoy the highest CTRs on Google Shopping, coming in with a cool average of 1.2%. The key advantage for these advertisers is that their products put a hefty emphasis on visual appeal – something shopping ads deliver plenty of. The story is largely the same for advertisers in food and alcohol and home and garden. On the other hand, when you’re selling things like desktop computers, staplers, and printer paper, you tend to zero in on functionality and let visual appeal fall to the wayside. Accordingly, shopping ads for products in the computers & technology industry and the office and business needs industry tend to look a bit … generic. Unfortunately, if you’re advertising in one of these industries, it’s easy for your products to get lost in the mix. Do your best to stand out! 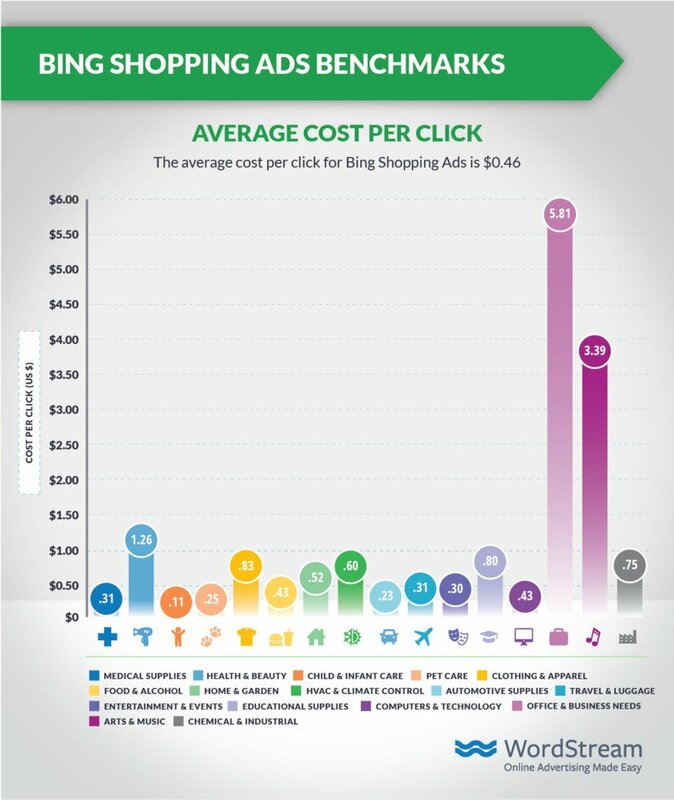 This chart is staggering for one single reason: Bing Shopping CTRs blow Google Shopping CTRs out of the water. This is only one of the several reasons we encourage businesses of all kinds to advertise on Bing. The lower degree of competition makes for a fantastic opportunity. 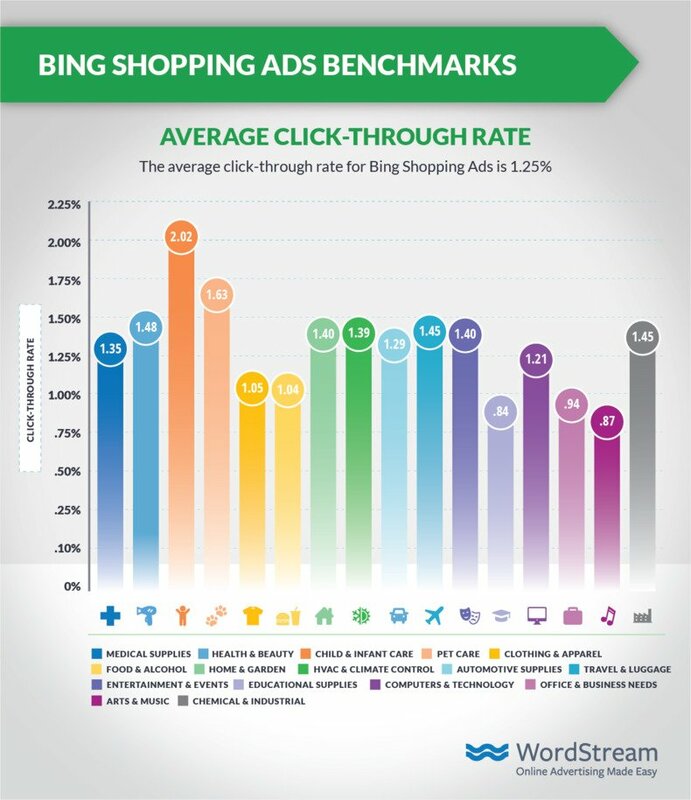 The average shopping click-through rate (CTR) across all industries is 0.86% for Google Ads and 1.25% for Bing Ads. The combination of a low average CTR and a fierce degree of competition makes for a high average CPC in the office & business needs industry. Nonetheless, the fact that the highest average CPC on Google Shopping is just over $1 is pretty incredible – some search advertisers pay well over $50 for a single click on a text ad! 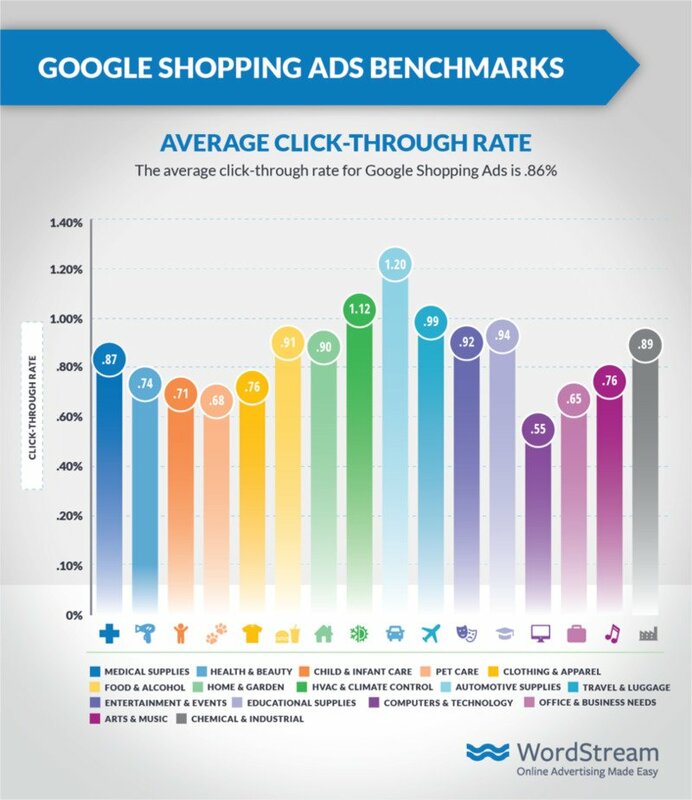 Looking at this chart as a whole, it makes a compelling case for running Google Shopping campaigns. Considering the high commercial intent that drives people to search, the prospect of paying less than $0.50 for a click is pretty enticing. 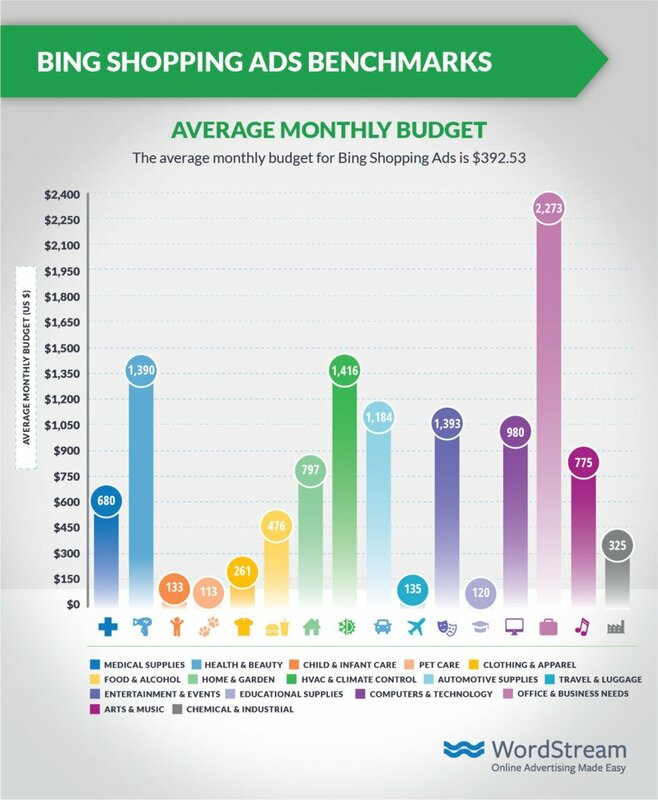 Although Bing Shopping is, generally speaking, an inexpensive alternative (or complement!) to Google Shopping, some ecommerce advertisers are paying a hefty price for their Bing SERP real estate. The prevalence of Microsoft computers (and, thus, regular Bing users) in corporate offices drives up the average CPC for office and business needs advertisers. More on that in just a bit. 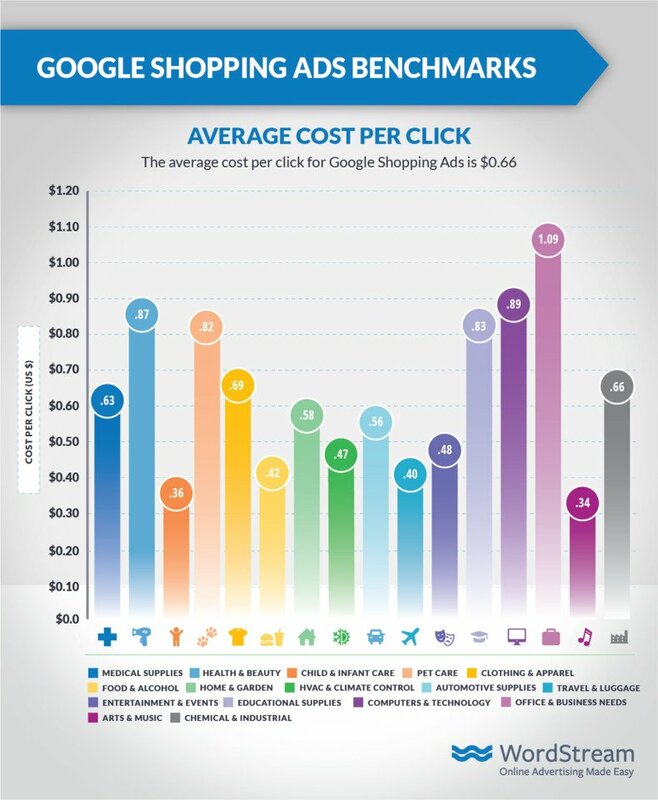 The average shopping cost per click (CPC) across all industries is $0.66 for Google Ads and $0.46 for Bing Ads. Typically, when a consumer needs something urgently, they’re going to convert more quickly than someone who’s casually poking around. For example, whereas a New Yorker who’s suffering in the July heat is inclined to buy that air conditioner unit right now, a man who’s browsing ferns during his lunch break probably isn’t going to make a purchase just yet. That’s why it’s not too surprising to see HVAC advertisers and medical supplies advertisers boasting the highest Google Shopping conversion rates. At the same time, though, businesses that sell clothes and beauty products are doing relatively well, too. That’s likely the result of affordable prices and familiarity – a cocktail that makes for low-risk purchases. Remember when we mentioned the prevalence of Microsoft computers (and Bing users) in corporate offices? 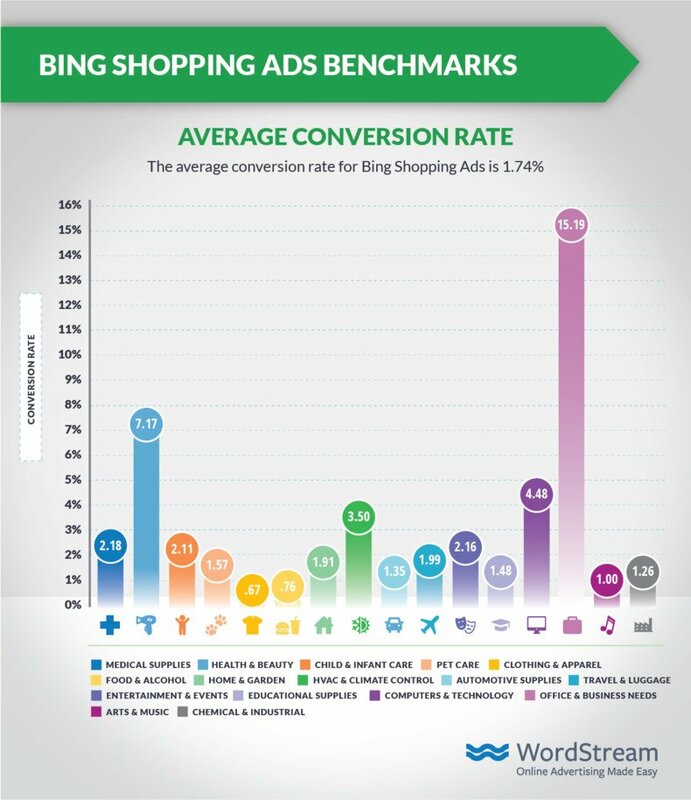 That’s the primary explanation for office and business needs advertisers’ amazing Bing Shopping conversion rates. People tend to shop for office supplies while they’re at work, and those transactions tend to take place through Bing. The story is the same for advertisers in the computers & technology vertical. 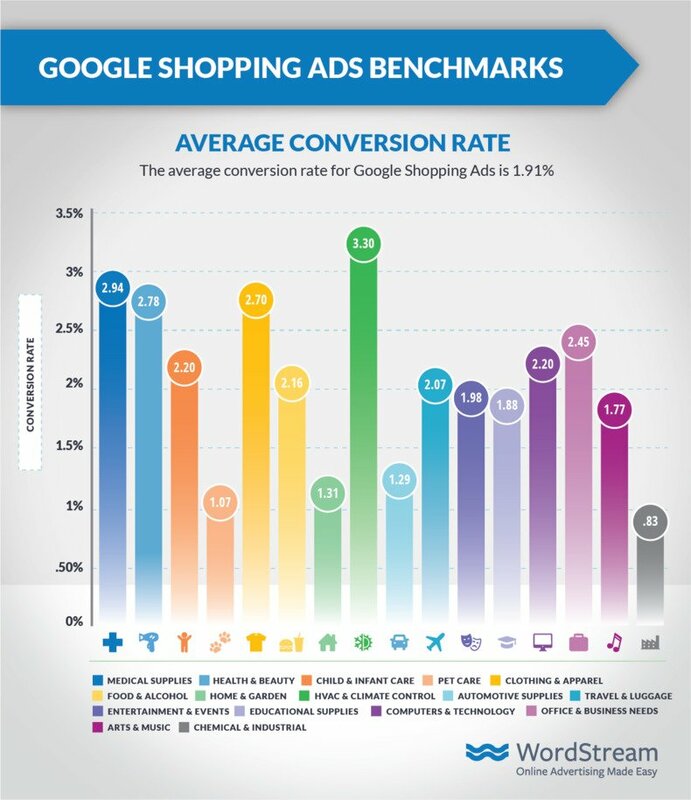 The average shopping conversion rate (CVR) across all industries is 1.91% for Google Ads and 1.74% for Bing Ads. Generally speaking, there’s a positive correlation between the price of your product or service and the amount of money you’re willing to pay to win a conversion. To be more precise, there’s a strong positive correlation between your profit margins and the amount of money you’re willing to pay to win a conversion. That’s why advertisers in the computers & technology industry and the chemical & industrial industry are working with those CPA figures. At the other end of the spectrum, sweaters, CDs, and packages of dog food aren’t the most expensive products in the world – hence the CPAs for clothing, arts & music, and pet care living well under $30. This chart is yet another testament to the relative lack of competition at the top of the Bing SERPs. On average, child and infant care advertisers are paying less than $10 for each conversion! 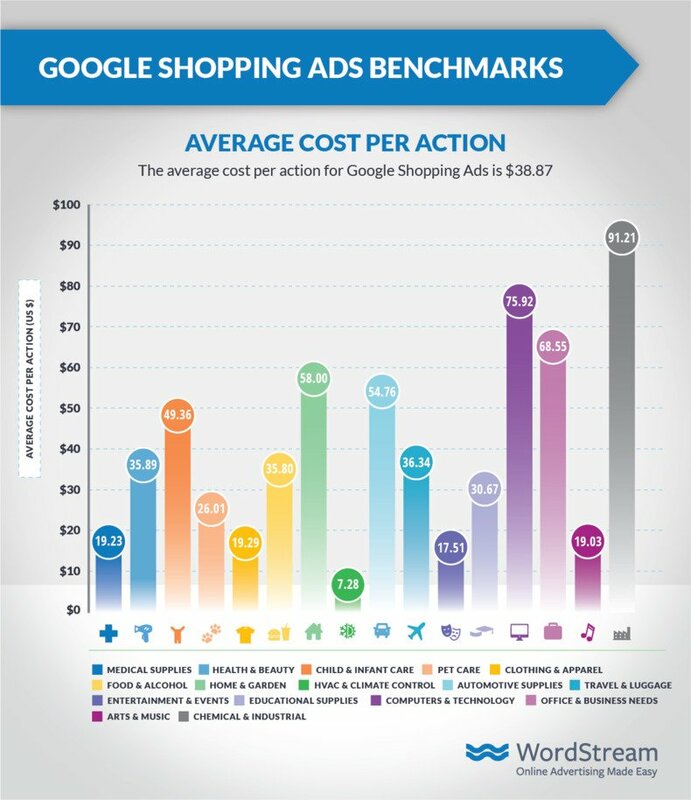 The average shopping cost per action (CPA) across all industries is $38.87 for Google Ads and $23.05 for Bing Ads. If your business is just getting started with shopping campaigns, or if you’ve recently inherited a couple of SEM accounts, knowing how much your competition is spending is incredibly helpful. Use the average monthly budget within your industry to give yourself a logical starting point. The good news is that many of you are selling products that can be effectively advertised through search ads, which means you won’t have to dedicate a ton of money to your monthly shopping budget. In fact, due to relatively low CPCs (compared to standard search), you may be able to drive strong results with as little as a couple hundred bucks a month! 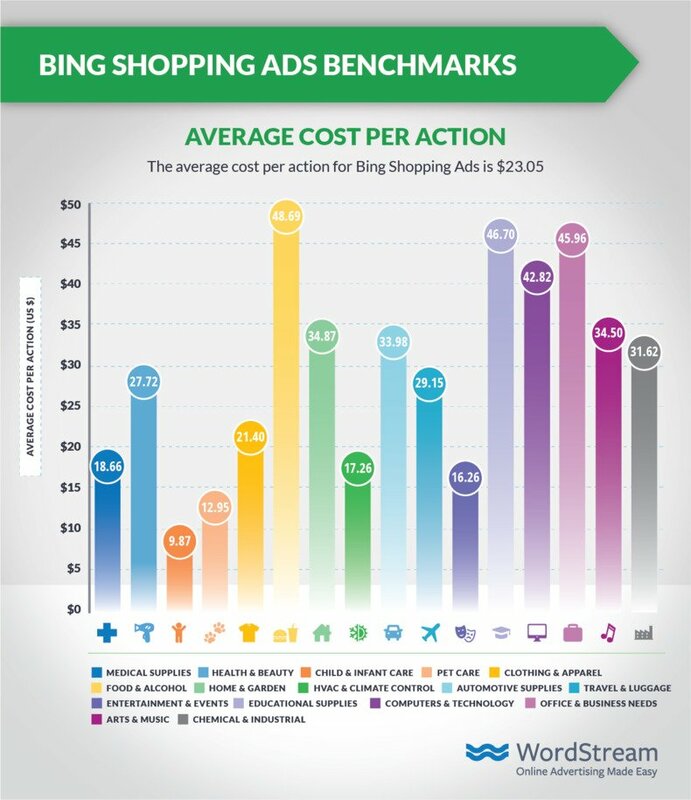 Although advertising on Bing is considerably less competitive than advertising on Google, your main takeaway from this chart should be this: Your competitors are, in fact, running Bing Shopping campaigns. In other words, failing to complement your Google Shopping presence with a couple Bing campaigns is a surefire way to miss out on valuable, inexpensive conversions. 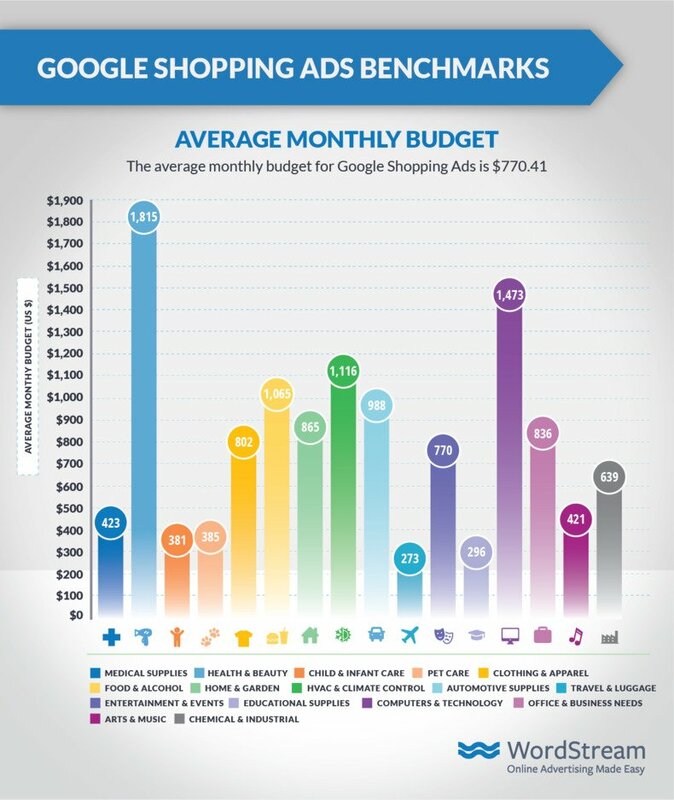 The average shopping monthly budget across all industries is $770.41 for Google Ads and $392.53 for Bing Ads. If you’re unhappy with the way you stack up against the figures in this report, don’t sweat it. Paid search is particularly tricky for ecommerce businesses. Between keeping your product data feed clean and up-to-date, managing your shopping campaign structures, and optimizing your on-site experience to maximize conversions, you have a lot of moving parts to keep track of. If you don’t have the time, resources, or bandwidth to take all of that on, we’re here to help. At the beginning of the month, we launched our brand new shopping software solution – WordStream Advisor for Ecommerce. With this tool, we’ll help you optimize everything from your data feed to your campaigns to your landing pages. This report is based on a sample of 671 U.S.-based WordStream client accounts in all verticals were advertising on Google Ads and Bing Ads Shopping networks between August 2018 and February 2019. Each industry includes, at minimum, 30 unique active clients. “Averages” are technically median figures to account for outliers. All currency values are posted in USD. Manage your ads. Optimize your feeds. The opinions expressed in this article are the sponsor's own. Manage your ads. Optimize your feeds. Grow Revenue.